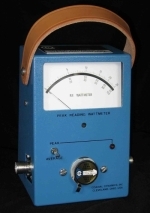 When you need Peak power measuring capability in the 2 to 2300 MHz frequency range and from 100 mW to 10 kW, then you need to get your hands on our Model 83000-A RF Peak Reading Wattmeter -- only from Coaxial Dynamics. Elements are sold separately. Similar in appearance and operation to our standard Model 81000-A Wattmeter, the Model 83000-A converts from Average Reading to Peak Reading, with the flip of a switch, by inserting a peak reading amplifier between the element and the meter. Complete with a built-in line section, our Quick Match RF connectors for 50-Ohm cables and transmission lines offer the speed and reliability you expect from Coaxial Dynamics. The Model 83000-A is designed to measure RF power in amplitude modulated systems such as television, telemetry, radar and peak envelope power (PEP) such as SSB and AM signals. The plug-in elements available for the 83000-A are inter-changeable with those for our Model 81000-A. Furthermore, peak only (high power) elements are also available. To compliment each application and specific requirement, elements are selected separately. Special elements for high power or extended frequency ranges are made custom by request. Self-contained and requiring no line power in either Peak or Average mode, the Model 83000-A is the right choice for portability and functionality. With peak reading circuitry that operates on one 9 volt replaceable alkaline transistor battery (supplied), normal, portable usage is possible for at least 90 days or the life of the battery. An optional, rechargeable battery is also available. Your confidence in the quality and dependability of the Model 83000-A Wattmeter is assured with the Coaxial Dynamics Two Year Limited Warranty.